It's sandal season! The downside? Putting our boots in storage means we're back to constantly monitoring our pedicures. The upside? All the amazing shoes. Obviously. And you know what's even better? When those shoes are available at awesome prices. Cue Target - our favorite place for inexpensive, wearable and adorable sandals. Today we have a round up of the best spring sandals from Target - check them out below! Confession time: we are obsessed with HGTV's Fixer Upper. Ok, considering the show's catapult to fame and the world's obsession with the hosts, Chip and Joanna Gaines, we suppose that's not much of a confession. So here's a real confession: Joanna Gaines designed a Magnolia Home collection for Nordstrom, and we are going to spend waaaay too much money on all of the awesome pieces. That's right! Your home can now have all those awesome Fixer Upper "character pieces." French doors not included. Did you hear the news? We just launched our Kids' Line! 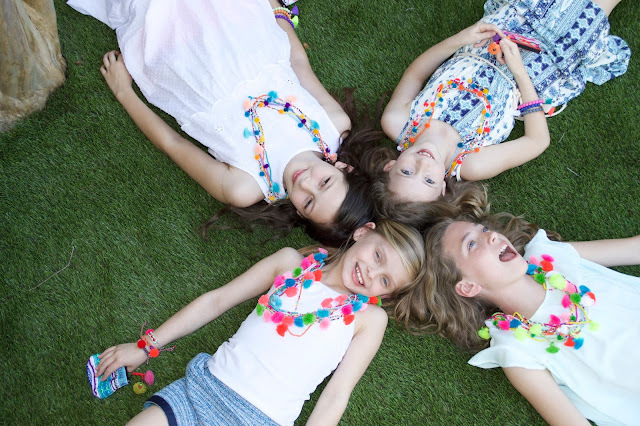 Meet AC for Kids, a collection for our youngest AC fans - with lots of matching mom pieces! Just in time for Mother's Day! Check out all the fun pieces here! Earth Day: Buy Cute Stuff, Save the World. Is it just us, or does saving the planet feel like a really overwhelming task? We all want to be more eco-friendly, but sometimes it feels impossible to check the environmental impact of every product we purchase. But in honor of Earth Day, today we are going to try. Below are three simple examples of some Earth lovin' products you can buy to tell the world you love it this Earth Day! Have you heard of this brand? H&M Conscious is H&M's sustainable fashion line. That's right - H&M prices, environmentally friendly goods. Need we say more? The beauty industry can really take a toll on the environment, so below we've featured some brands that are more eco-conscious. From organic ingredients to biodegradable packaging, you and the planet will be looking good with these products. Ok, it's time for us to shame you. Are you seriously still using plastic and paper mugs and cups?! Seriously, go grab some reusable drinkware. Obviously you'll be helping the Earth, and these are way cuter than the disposable options anyway. We love shopping the sale rack, but there's always one problem--everything on sale is for the past season! We end up buying sweaters in spring and swimsuits in the winter...not ideal. Thankfully, LOFT feels our pain. They are offering 50% off all spring styles! Hear that? That means you can buy some cute stuff for half off that you can wear NOW! Thanks, LOFT. You get us. How do you deal with stress? If you often find yourself ignoring your to-do list while eating a pint of ice cream, we hear you. But you can't ignore stress--it will just get worse. So today we are bringing you 5 tips to banish stress in your life, with some practical items to help you out! Ok, we know this one sounds ridiculously obvious. But before you can truly set up habits to prevent stress, you need to de-stress. Your first step is to take an evening to get some R&R--soak in the tub, read, listen to calming music, wear a face mask, sprinkle some lavender on your pillow and go to bed early. This will help relax you and set you on the path to a stress free life (ok, as stress free as life can get) so that you will be ready to handle whatever gets thrown at you! Raise your hand if you got your full 8 hours last night. Anyone? We'll admit it...we don't always get as much sleep as we should, either. It seems that when our lives get busy (or we just want to watch one more episode of Netflix...), sleep is the first thing to go. But there's nothing that affects our bodies and stress more than our sleep--if there is one tip you implement from this list, this should be it! So here is your challenge: turn off your phone, the lights, and your brain and get 8 hours every day this week. You'll be amazed at how much better you feel! As much as we'd sometimes like to ignore the research out there, exercise really does help relieve stress and provide energy. It can be hard to find the time to work out (or just get our butts off the couch), but the payoff is worth it! Exercise gives us endurance to handle the day, and it ups self-esteem. Sign-up for a new class or call a friend to be your work out buddy and hold you accountable. We love to be lazy, but in the end a little sweat makes us feel better! Is wine a food group? Veggie pizza counts as a healthy dinner, right? Ok, obviously we don't always make the healthiest choices. And while we're never going to turn down Taco Tuesday, only eating junk can take a toll on our bodies. It makes us sluggish and clouds our brains, which definitely makes it harder to deal with stress. This month, commit to making three healthy dinners a week. Getting some greens and healthy protein into your diet will up your energy and cognitive function. Dust off your recipes Pinterest board and make something healthy and new! Bear with us--we know this one is a little cheesy. Every night, write down three things you are thankful for or three great moments from your day. We know--this is on every "ways to be happy" list out there. But there's a reason for that! Making note of the good parts of life puts the stressful parts into perspective. It reminds us how lucky we are and that any stress we're dealing with is totally worth it. Plus, looking for the good in your day will start to become a great habit. You'll begin to notice all the awesome things in your life like never before! And always remember--you got this! Mother's Day is May 8th, and chances are you past the age where you can give Mom a plate with your hand-print on it or an acrostic poem. This year vow to get her something awesome--something beautiful and high quality that she will love, but would never buy for herself. Mom's are the most giving people on the planet...it's time for us to do the giving! Are you a mom yourself? Forward this post to your spouse or children...you won't be disappointed! Much love to all our moms (and grandmas!) out there! We love our fashion Pinterest boards, but when it comes to style stalking nothing beats our Instagram feeds. 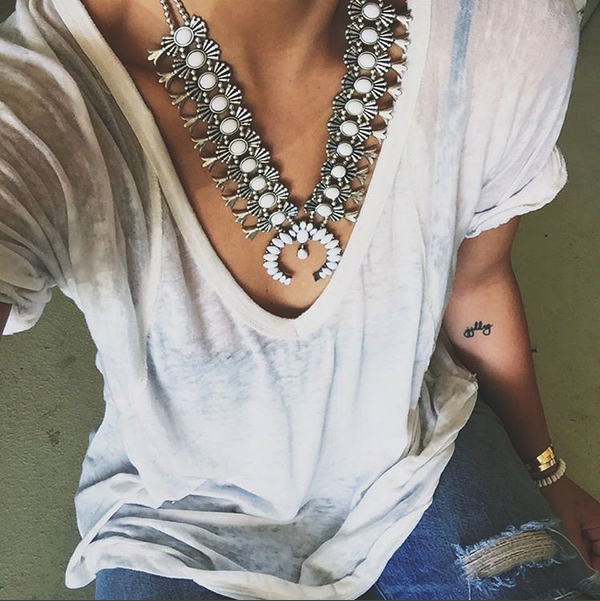 Seeing how real ladies rock our jewelry is so inspiring! Today we are showing off three women who make us look good and telling you how to get the look! Want to be featured on our Instagram or the blog? 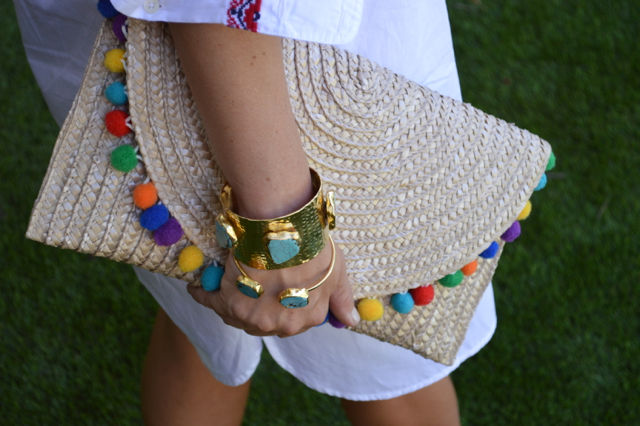 Be sure to tag us @accessoryconcierge and use the hashtag #accessoryconcierge. We love seeing your photos! We adore Tori Gonzales and her amazing urban boho style. The basic tee with our White Naja Necklace is the perfect combo, and distressed jeans keep everything downtown cool. It's no secret we're obsessed with Courtney Kerr--who else would think to wear red on red with a pop of animal print?! Our Leopard Pony Hair Clutch has never looked better. Take note, ladies. You can go from the office to date night in this gorgeous look from Julie Solomon. 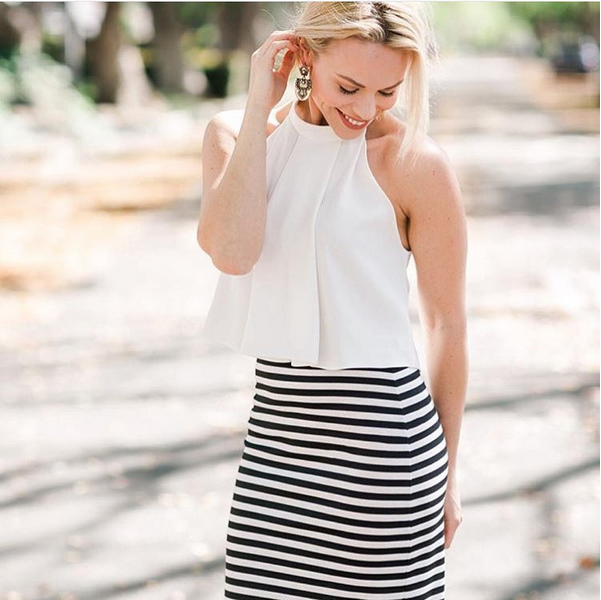 The halter top draws attention to our Luxor Drops, and the striped skirt keeps it fun! 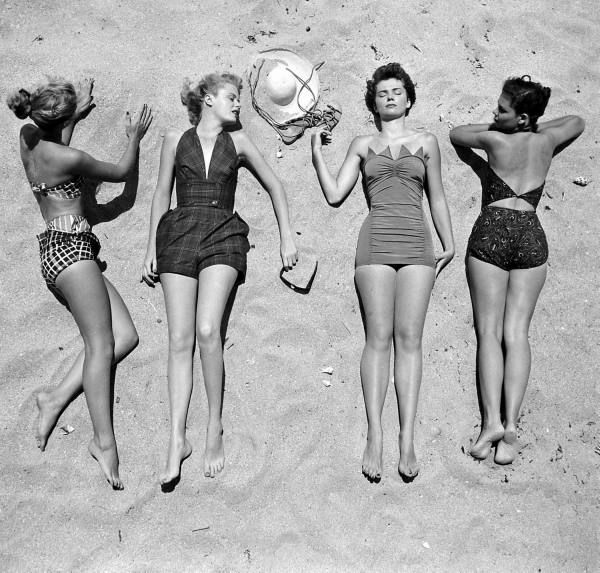 Breathe in, breathe out and count to ten...it's swimsuit season. Before you freak out, allow us to give you a tip: you know the whole "get cute workout clothes and you'll want to go to the gym more" concept? The same is true for beach days. You'd be surprised how a new suit and pair of sunnies can boost your confidence. And with the magic of the internet you can order a few options, try them on in the comfort of your own home, and return the things you don't want! Talk about a revolutionary approach to swimsuit shopping. So with that in mind, check out all of the great swimwear and accessories below! Need a little liquid courage before you get into your suit? Okay, not that liquid courage--we're talking about self tanner! Check out these options to get some color before you even get in the sun. A little glow goes a long way! Have you ever noticed that celebrities are always photographed wearing sunglasses? Perhaps some people think it's the fame and fortune, but we think the sunnies are what really create the cool factor. Grab a new pair and try to avoid paparazzi. The main event! One piece, two piece, high waist, cut-outs...the options are endless! Order a few and return the ones you don't love for an anxiety-free shopping experience. Your swimwear soulmate is out there! The cherry on top? Your super cute cover up. These adorable tunics and dresses take your swim style up a notch. Just a day at the beach? Psh. It's your runway. See--there's no need to fear! Enjoy soaking up the sun! If you're following us on Instagram, you may have noticed we are in Los Angeles this weekend! We don't want to brag or anything, but the beach vibes are real. You may be miles from the shore, but there's no harm in playing pretend is there? After all, summer vacation is just around the corner! With that in mind, we've created our ultimate beach day outfit for you to add to your packing list for your next trip. Click the items on the image below to learn more!